2011: I'd like to thank Ronald Kelly for the story to accompany this card! "Daddy . . . is the Halloween Train for real?" asked Donnie. "No," his father told him. "Not anymore." But it had been once. His parents had taken him several times, on the train that traveled to the little town of Harvest and a wondrous night of trick-or-treating. Then, when he was Donnie's age, he had missed the festivities due to sickness. It was the year that the train had derailed and 139 children had never made it to Harvest alive. 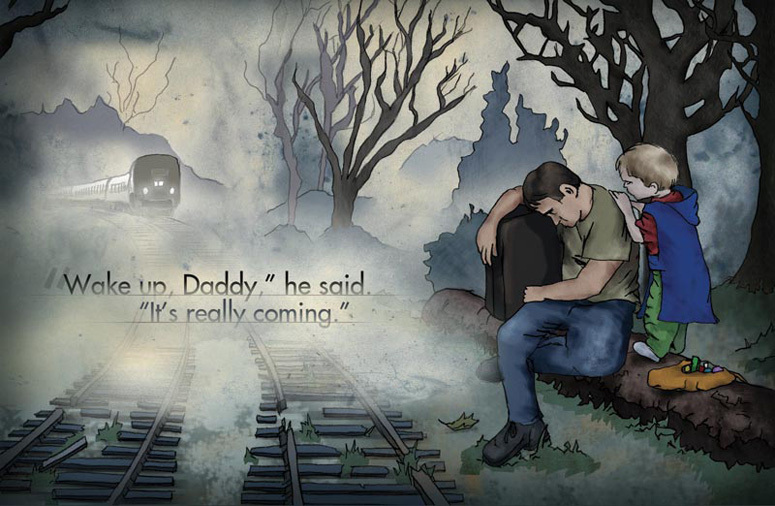 That night, as All Hallows Eve came to a close, Donnie dreamt that he and Daddy waited beside railroad tracks, broken and long abandoned. He was still dressed in his goblin costume, candy bag in hand. His father sat on a log beside the black forest, sleeping, using a suitcase as a pillow. From out of the mist it came, slithering like a long, black snake through the night. "Wake up, Daddy," he said. "It's really coming." Then it was there before them. Dark, silent . . . waiting. "All aboard!" called the conductor. "Room for two more." With Donnie's urging, Daddy sluggishly left the log and they mounted the stairs. Inside sat cowboys, princesses, pirates, and ballerinas. Each of their pale and painted faces was set in a frightening rictus of both horror and delight. When the train lurched forward on its journey, Daddy's eyes cleared. "Where are we?" Beyond the windows, somewhere in the mist, he could hear Mommy begging . . . pleading . . . for them to wake up. Thanks, Ron, for such a great story!